We’ve just launched our LV4 Pro handheld dimmer. The standard LV4 is our market leading, 4 channel, RGBW LED controller with embedded Lumen Radio. Working closely with our clients, we are always seeking to improve the technology and functionality. 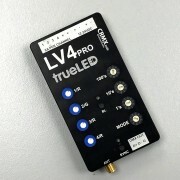 As such we have developed the LV4 Pro, a smaller, slimmer device that handles twice as much power as the standard LV4, with up to 8 amps per channel. With a custom CNC machined enclosure, we’ve been able to make the controller even more compact and efficient than before. The width has been reduced by 30% and we’ve added a DMX output so the device can be used as a DMX receiver if required. Both the LV4 Pro and the standard LV4 feature short circuit protection, black out function and work with a supply of 12-24 VDC. For full details on the standard features click here. As with all our products, we can create any additional custom modes for our clients’ specific requirements. 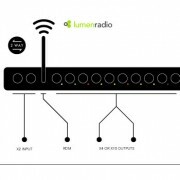 Our research and development team have been busy and we will be launching a 32 / 40 way desk shortly, along with new radio desk software to significantly improve functionality. Office Expansion & Seeking Electronic Product Designer Merry Christmas from everyone at EMP Designs!